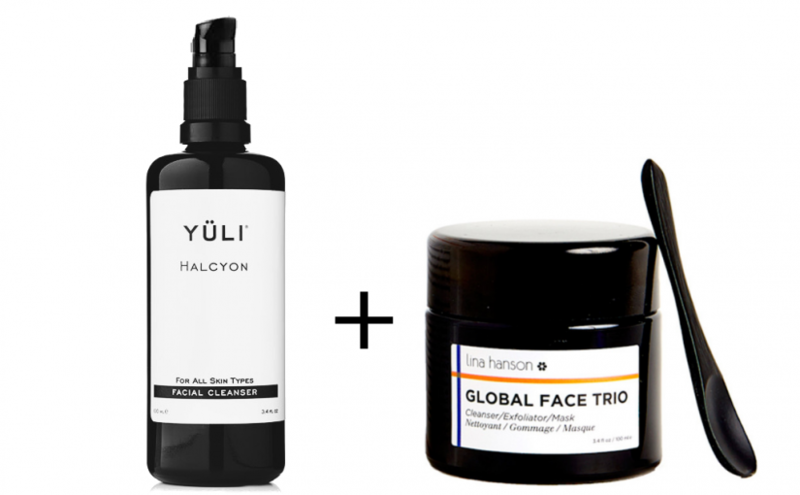 My usual routine: Every two to three days, after I remove my makeup, I’ll add a dry, physical exfoliant like Lina Hanson’s Global Face Trio (c/o Boxwalla) to one of my favorite cleansers, YULI Skincare’s Halcyon (full review) as my second cleansing step. Normally you would mix one of these powder exfoliants with water, but by activating this gingery concoction instead with the gentle mix of hydrosols and peptides of Halcyon, I kill two birds with one stone. I’m gently cleansing my face but also adding a bit of scrub to slough off dead skin cells that could be clogging my pores at the same time. 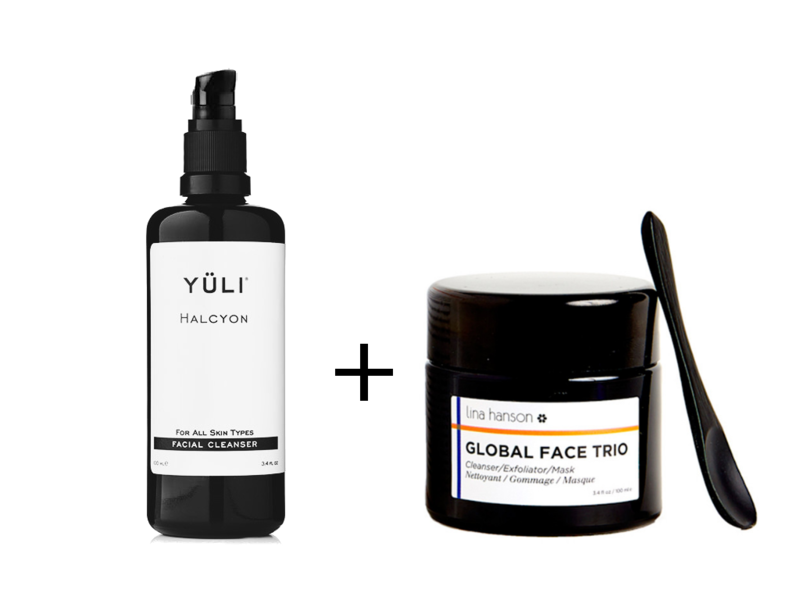 Could I also just cleanse with Halcyon, and then scrub with the exfoliant + water? Yeah, but I like that mixing the two together means less steps and less time needed. If I’m so inclined, I’ll also leave the mixture on my face for several minutes as I hop in the shower as sort of a quick mask. 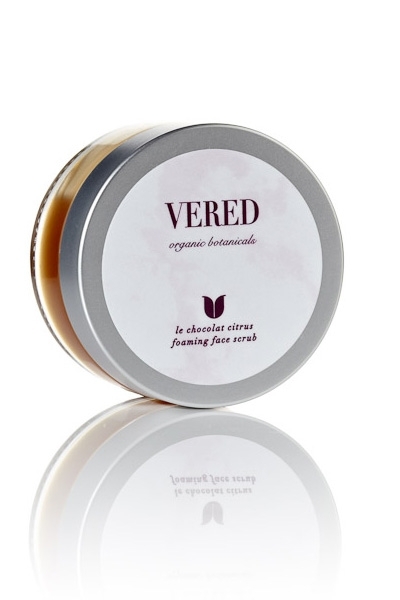 What I’m adding: I’ve just picked up Vered Botanical’s Le Chocolate Citrus Foaming Face Scrub, which I’ve been eyeing since I started trying products from her line (ancient reviews on the Therapeutic Balancing Oil and Herb-Infused Toner). For some time, I avoided all physical exfoliants as not to exacerbate my acne, and used mostly chemical exfoliants (e.g. via fruit enzymes like in one of my faves, Tata Harper’s Resurfacing Mask). A facial I had at Gressa Skin last year got me hooked back on sugar scrubs. Even though it’s quite scrubby, and I still wouldn’t scrub with active acne present, my skin responds really well to that sort of treatment. That’ll be the citrus-y and lemon-y oils (lemongrass, lime, orange, tangerine, may chang) combined with rosewood essential oil and cocoa absolute. Beyond providing a refreshing scent, the citrus oils are meant to brighten the skin (some sources), but I’ll keep on using it to see how that goes. In the jar, the essential oils and sugar get quite separated, so I had to give it a mix with a (clean) spatula before scooping a bit out. Per the instructions, I added a bit of water, rubbed my hands together and began to scrub. True to its name, it foamed a bit, which I later connected with its inclusion of castile soap–which is also used in their oil cleanser to allow the cleanser to be rinsed off with water. This makes me think I could use this to replace my second cleanser altogether on certain nights, but I’ll think on that more. The sugars separated a bit as I massaged the mixture onto my face such that it didn’t feel like I was scrubbing my face off–rather it was quite gentle. Upon rinsing with water, my face felt really smooth and I could tell the jojoba oil + essential oils had been left behind on my face, which I didn’t mind, and kept my face feeling soft even past my shower (which I then promptly hopped into). I’ll keep you posted on the brightening effects, but especially on late nights (of which there will only be a greater number because the end of the school quarter is coming), I think I will really appreciate the lovely scent, and hopefully I can ward off future acne caused by pores clogged up with dead skin cells. My usual routine: Every other night (or every night, if I’ve gotten particularly sweaty that day), I’ll hop in the shower, shampoo my hair, condition my hair, let the conditioner seep in while I soap up my body and clean the towel I used to remove my makeup with in conjunction with my makeup remover, and rinse everything off. Depending on how tired I am and whether I’m shaving, I like to think I can keep this routine to under 10 minutes. What I’m adding: Recently, thanks in part to my hair’s increasing vulnerability to California dryness, I’ve started dabbling with hair masks, hence why I picked up Rahua’s Omega 9 Hair Mask. For background, I have straight, thick, Asian hair which typically very easily gets weighed down if I apply product. Recently, I don’t know if it’s my shampoo or my hydration levels or what, my hair has been a little more on the tangled and rough side. I didn’t have good experiences with “hair masking” via saturating it with oil and then shampooing it out before, but a couple weeks ago I had success, and my hair felt quite renewed. I gave this a go last night in my shower, and if I may say so, I’m having a pretty great hair day. After shampooing, instead of reaching for conditioner, I massaged a couple of pumps of the hair mask primarily into my ends and then a bit closer to my roots. The instructions say to leave it in for 10-15 minutes, so I then proceeded to wash my body, clean my makeup-full towel, and shave. In a perfect world, I would have a bathrobe, so on the days I don’t shave, I could tie my hair up, walk out of the shower, and kill 10-15 minutes another way. But for now I’ll probably have to just reserve this for the times when I am genuinely going to spend that much time in the shower so that I don’t have to walk out of the shower since I’m done cleansing the rest of myself, and then go back in the shower to rinse out my hair. The scent is very simple, unlike some of their other products I’ve tried (shampoo, conditioner, body oil) which are pretty heavy in palo santo oil (which I LOVE) and non-offensive, and not mind-blowing but not offensive. Especially as I am planning to partially balayage my hair later this month, I’m really looking forward to continuing using this product to keep my tresses bouncy. So now, I’m wondering. Especially when you are tired and run-down, what are your favorite ways to pamper yourself? Disclaimer: Mostly said in the preface, but I’ll repeat it again here. This is a sponsored post by Follain, and I am being compensated for this post. That being said, all opinions expressed in this post are my own. Amazing use of GIFs and enjoyable review! So glad to see you’re writing again!!! I’m still waiting for you and your words for you know what little lady!!! Thank you Kate <3 I'm still pondering on it! So glad to see you back and with any luck, back and updating regularly? It’s been pretty empty on the blogosphere lately. Does Follain carry Yuli now?!? Their cleanser is so. bloody. good. Thank you Carrie!!! Ah, I wish Follain carried YULI–I should’ve been more clear that only some products mentioned in the post are from Follain and others are not. Holy grail cleanser.